CarCade is a prototype gaming system that uses a natural landscape as the gaming area. 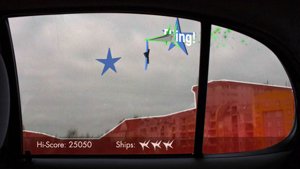 By using a webcam with tracking software the system can track images of the landscape you drive past in a car and use it to create a game from. When the driver of the car speeds up, so does the game making it more difficult to control the plane and dodge buildings. Of course, this is not for drivers though and is aimed at passengers. It’s not a bad idea and certainly does introduce a unique element to games that I certainly haven’t seen before.